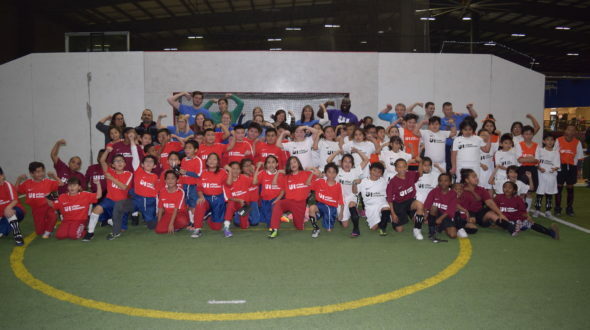 Amidst a snowy Friday afternoon, an energetic team from Slalom Consulting brought the heat as they welcomed Work to Play teams from Beethoven, Little Village, Sandoval, and Kozminski to Chicago Indoor Sports for an afternoon of friendship and play. Wide-eyed and jittery with excitement, UI’s newest partner school, Sandoval, entered the sports center ready for their first ever Game Day! 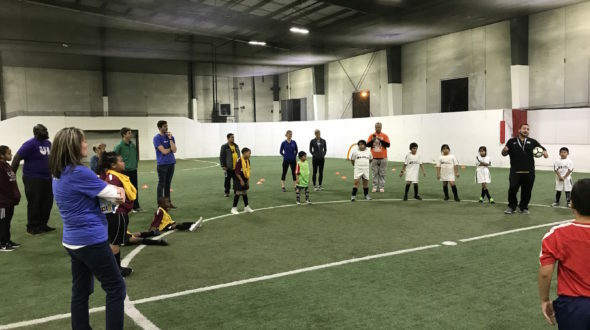 As volunteers helped some players lace up cleats, others joined players hand in hand as they ran onto the field ready to warm up and show off their newly developed soccer skills. As scrimmages began with the small groups of WTP players, competition heated up on the Take The Lead field. Two brave Slalom volunteers joined 12 team captains as they challenged each other – full field! Although competitive in spirit, UI players, parents, and coaches stayed true to UI values of inclusivity, teamwork, and sportsmanship. “The kids were amazing. They were considerate, well-mannered and we felt welcomed – the smile on their faces when we cheered them on was priceless – we felt a real connection with the players,” said Dana Anderson, a Slalom volunteer. “We witnessed players from opposite teams helping each other up after a fall and putting an arm around each other after an accidental collision. There were no harsh words only positivity on and off the field from the players, staff and parents,” Anderson stated. 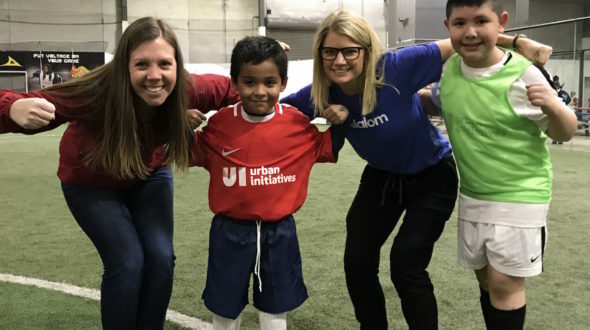 Thank you to all the volunteers from Slalom who took time out of their week to participate in an afternoon of soccer, fun, and friendship with our students and communities. We’re excited to have you back out on the field again in a couple weeks!